A beautiful front entrance of your home is the first opportunity to impress and the all-important curb appeal is achieved with cleverly designed spaces. Clearly defined pathways from a driveway or front gate direct your guests to your preferred entrance be that a front or side door. You want to bring your guests on a journey into your home and the path design allows you to make that enjoyable whilst injecting your personality with gorgeous material selection, plants and design details. The choice of paving design for your front entrance driveways or paths should complement the house and any already established landscaping features. Incorporating flourishes of you into the main entrance will enhance the connection of guests to your home and will seamlessly transition the outdoor space to indoors with a consistent look and feel of connected elements. A curving path provides more visual interest than a straight walkway, making it a feature in itself and accenting the surrounding garden. Scented plants and striking blooms along the curved path edges enhance the curve design and make the journey a beautiful and interesting one. Placing a contrasting bench or water feature along the curves adds more interest and draws people along the path making them want to continue their journey to the next destination point. 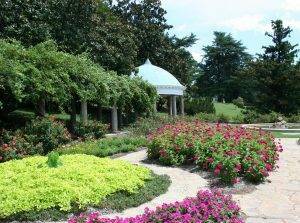 Taller flowering plants planted at a bend in the path create mystery by hiding what’s on the other side. Tried and true elements of a path or driveway paved in the traditional herringbone pattern bring a touch of class to any traditional style architecture. Understated edge lighting would highlight the beauty of the paver pattern and guide people to the front entrance. 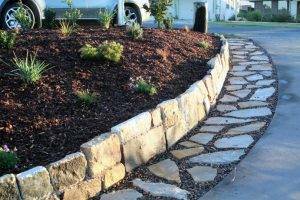 For a modern twist, this traditional path could be contrasted with stacked, irregular-size stone pieces to form casual borders for the flowerbed. 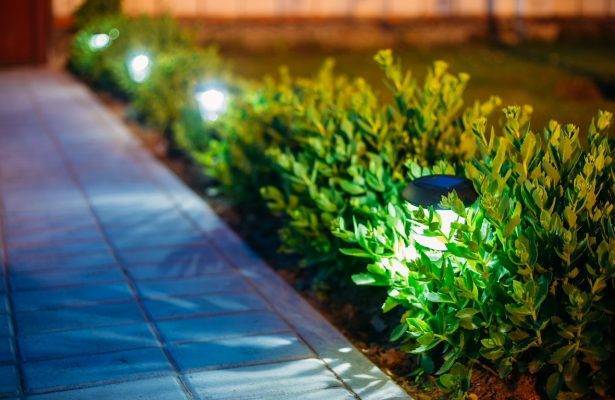 To achieve this paired back, calming Zen feel to your front entrance an understated path adds a perfect front yard accessory to a home’s modern lines. Irregularly placed flagstone pavers with contrasting river pebbles as fillers between the pavers provide interest whilst offering simplistic Japanese design. Pathways true to Japanese design will be asymmetrical and to create mystery and suspense, the path should meander. 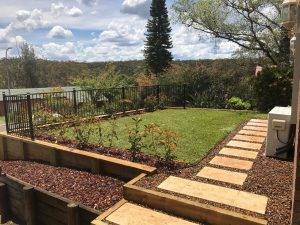 Sloping land doesn’t stop you creating a beautiful front entrance, in fact, it provides the opportunity to make something spectacular with creative landscape planning. Breaking up the walkway into separate segments is a clever (and easier) way to put in a path on a slope. Using contrasting paving materials such as slate and brick provide visual design elements with both colour and texture. Grass offers a visual break between oversized stepping stone pavers.